Bacon with sunny side up eggs served with toasts. Breakfast is the first meal of the day. It’s named after the end to the pause most of take in eating overnight. This pause is called a “fast” and in the morning, the fast is broken, hence “breakfast”. Some people pronounce breakfast as “breafkast”, which is acceptable up until the age of 18 and after that it’s just not cute anymore. 1/2/2016 UPDATE: I now have a whole site dedicated to breakfast at Breakfast Club Me. Check it out. The best breakfast consists of bacon, eggs, hash browns, and biscuits and gravy. This is what I call the “base four” or the “quintessential breakfast.” It’s very hard to pull off at home and there are very few restaurants that offer this as a combo. This is because they know that’s what people want and can charge more on that one item you have to order to make your breakfast complete. Hardee’s is the only restaurant that I know of that offers the quintessential combo, but it doesn’t come with a drink. Again, you have to pay extra for perfection, but at least Hardees recognizes a man’s needs – something Hardees does very well. Hardees is the Taco Bell of breakfast. Take their breakfast bowl for example. They take all of the base ingredients from the base four, but put it in a bowl instead. And the best best breakfast sandwich ever, the Monster Biscuit, does this and more. What it lacks in gravy it makes up in ham. I’ve written to Hardees specifically asking them to make a biscuit and gravy sandwich, which I feel would really round out their selection, but they’ve yet to implement it. Sausage is not only a base ingredient in gravy, but can be cooked as a patty or as a link. Unless you’re cooking for gravy, the sausage should be kept at an even heat throughout the cooking process allowing the inside to cook and the outside to sear. This is what will lock in the juice on the inside and caramelize the outside. Unlike hamburger patties, you’ll want to flip your sausage often to keep the heat as even as possible allowing the inside to cook before the outside burns. When given the choice, I almost always opt for bacon over sausage, which is our next meat. Bacon, the only meat to taste both sweet and salty at the same time, will be cooked slightly crunchy if you’re an American. Leave the limp bacon in France for when you’re just passing through. Like sausage, bacon should be flipped often and don’t try to cook a pound at a time. You’re not tossing a salad here, you’re graduating a class of delicious strips of bacon. Unlike sausage, you want to turn the heat down slightly over cooking as the grease in the pan increases. Wait for the the pops to slightly diminish and the aroma to lift before removing the bacon from the pan. Do not leave the bacon while cooking it. It will cook faster when you’re gone than if you are watching it, but no matter how short you’re away, the bacon will burn. Burnt bacon is only good for grandmas and garbage cans so keep your eyes on the prize and watch that bacon. 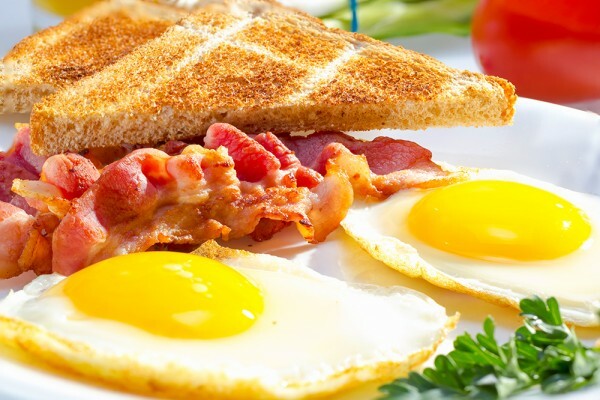 There are many different ways to make eggs and everyone has their own opinion about what is best. I used to like making scrambled eggs after frying up some bacon in order to use the bacon bits leftover in the pan. I did this once for a friend and he freaked out, rejected the eggs and the breakfast. He also prefers hamburgers with only ketchup and nachos with only cheese, so I shouldn’t have been surprised, but every since, I’ve subtlety changed the way I think about making eggs that way. I like to think that I don’t have a favorite type of egg, but egg moods. Sometimes I want a scrambled egg and sometimes I like them over easy. I don’t care for a poached egg or sunny side up, lets not get crazy, I say. Boiled eggs are okay after church on a Sunday picnic, but let’s not bring them into the breakfast nook where they don’t belong. You can pack me some when I become a steel worker and I can eat them out of my metal lunch box while sitting on a beam 400 feet over Fifth Avenue. Even a certain type of egg like scrambled eggs can be cooked differently. There are those who make them essentially like omelette in sheets and those who make them fluffly. I prefer mine to be the texture of sausage gravy, somewhere in between the two, but even I have trouble cooking them just so. When cooking an egg, you must be prepared with your strategy going in because once it hits the pan, there isn’t much time for adjustment. Here’s how I prepare the perfect scrambled eggs. Start by getting your pan hot, which I consider slightly over medium heat. While the pan is heating up, crack your eggs into a bowl, get a fork, and stir them up. Test for heat by dropping a pad or two of butter into the pan. Listen for the sound of the sizzle and watch for the color to run run clear. Butter is mostly water so don’t wait too long before adding the eggs or else the butter will burn. Drop your eggs in and begin slowly stirring like a good gravy. Keep stirring until the eggs begin to roll into balls. Turn off the heat before you think you need to. They’ll keep cooking even without the added heat. One of the most important, yet most neglected breakfast item is hash browns. Why is it that so much effort has been placed in this country to perfect the perfect french fry, yet our hash browns wallow in the wasteland of the culinary arts? Let me be clear, I am talking about the long, thin strings of potato like you get at White Castle in a cake, not the cubes of potatoes. There needs to be an amendment to the constitution or at the very least a Wikipedia entry stating which is which. We can’t allow restauranteers to continue to get this wrong. Countless breakfasts have been ruined by the misconception of this oh so important difference. Hash browns are best prepared days in advance of when they will be eaten. The best hash browns go into the deep fryer frozen and come out golden brown. When plated, they should nest in between the gravy and the eggs, not to touch the bacon or the sausage. I like to add both salt and ketchup to my hash browns and don’t mind if a little gravy gets on there too. If you don’t know how to make good biscuits and are not willing to spend 10 years perfecting your recipe, then you’re better off going to Hardees or getting some poppin’ fresh dough because those are your next two best options. The best biscuits are fluffy on the inside, golden brown on the top and bottom, and white around the edges. They should look like a sandwich waiting to be stuffed with meats and cheeses or split open for some butter and strawberry jam. Cracker Barrel is to Mexican restaurants as Hardee’s is to Taco Bell as their unlimited “chips and salsa” are their unlimited biscuits. A good strategy is to order a meal with a side of gravy and get the biscuits as part of your meal, thereby obfuscating the fee associated with purchasing biscuits and gravy outright. Having said that, an order of biscuits and gravy at Cracker Barrel already contains unlimited refills, so you have to judge how much you value social norms. There are several types of gravy, some made with or without sausage, some white and some brown. The best gravy is made from grease and flour, but since restaurants don’t often have enough grease from sausage to cook gravy, they often use oil, which makes the gravy seem much more like gelatin than pudding. The worst offense is to use chipped beef in gravy. If you can’t put little balls of sausage in my gravy, just serve it white or not at all. A little honey will go a long way. When I was young I was taught to break apart my biscuit and pour gravy all over the top, then eat it sort of like a casserole. I’ve since learned that the aesthetic appearance of eating it New York style as an open-faced sandwich is much more pleasing and can save time. When trying to maximize all-you-can-eat biscuits and gravy, you have to be efficient. Being efficient doesn’t mean being stupid. Pouring your gravy over an unopened biscuit will ruin your biscuits and gravy. Just don’t do it. Take the time to split the biscuit open to fully enjoy your meal. The best places to get biscuits and gravy are in greasy spoons and small town diners. They wouldn’t be able to stay in business if they sold bad biscuits and gravy. Like the coat of a dog shows what kind of food he eats, biscuits and gravy represent how a restaurant is run. If the biscuits are hard and crunchy, they’re coffee is probably going to be bitter too. If they put chipped beef in your gravy, that’s probably not real eggs you’re eating. Pay attention to the little things and you’ll get the big picture. Fruit says, “I care enough about you to not give you what you really want for breakfast.” If you’re getting fruit for breakfast, the person serving you is either too cheap or too lazy to get up and fry you a pancake. In fact, the only time fruit should be included with breakfast is in a pancake, which is what I’ll talk about next. Sometimes you’re not in the mood for biscuits and gravy cause you just had it for dinner last night. In that case, the next best thing is pancakes. Like biscuits and hash browns, your pancakes should be cooked golden brown. Basically, there’s a reason why it’s called golden brown, because like gold, it’s the best. When cooking pancakes, wait for the bubbles to start popping up through the mix and then test a corner by lifting it up to see if that side is done. If you’re a pro like Uncle Buck, you’ll flip it in the pan. Otherwise, use a spatula. One of the nice things about pancakes is the ability to pour syrup all over them. You may drink Diet Coke and refrain from adding sugar to your coffee, but when it’s time for some pancakes, you’re smothering them with syrup. Why? Because it’s delicious (and they can be really dry without it). And do you really want to put all of those Maple trees out of business? Michigan has enough unemployment with you skimping on the syrup so next time you’re in the grocery store, go ahead and get the good stuff, you know you want to.